Mea culpa: I’ve contributed to some less-than-stellar food photography appearing in the social media. I could stand to build a good lightbox and get some advice on how to photograph chocolate, it’s true. So in the interest of not making something amazing look nasty on the internet, I’m picking a different image for this post about the bourbon ball candy I made last weekend (it did take portions of all three days of the weekend). At right is a recipe for a very tasty cocktail, which was procured on our Oaks night prowl this year, by Duane. The chocolate treat of which I speak is quite delicious and if you see me in the next 12 hours, you might get to sample some of this first batch. We first tried bourbon balls at a tour & tasting at Woodford Reserve distillery, two years ago. The tour was very enjoyable, as are the picturesque and spacious grounds, not too far from Lexington, Kentucky. The tasting was okay – as good as it could be, sampling good liquor from plastic souvenir shot glasses. The bourbon balls were underwhelming –perhaps just too subtle– for me. Why be subtle? 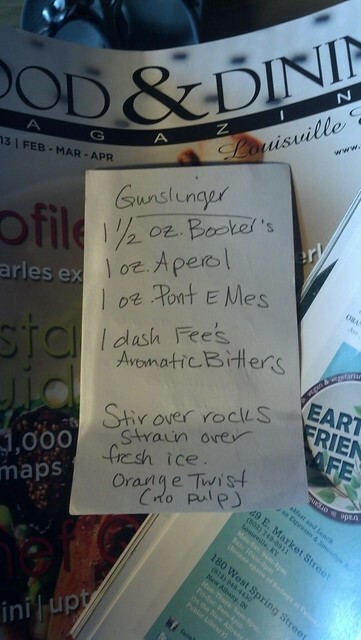 A friend in Louisville recommended a recipe to me; below I’ll share my version. While in general I wouldn’t modify a recommended recipe, it left a little wiggle room (asking for “chopped nuts”) rather than specific nuts, though I’m willing to bet that pecans are the norm. I prefer walnuts to pecans. Also: in our family is a recipe for a chocolate ball candy (buckeyes) that includes some paraffin, to help the dipping chocolate stay smooth and to allow the candies to set. It works well, so I tried it with this new recipe. This did seem to extend the chocolate volume, and I had lots left over, just 12 oz of chocolate may be fine next time. Or, I may need to make the balls a little smaller. Paraffin is edible, and safe to eat in such a small amount (I wouldn’t recommend eating more than one ball per …day, for various reasons, however). Inspired by a version on All Recipes. Place the nuts in a sealable jar. Pour the bourbon over the nuts. Seal and allow to soak overnight. Mix the butter and sugar; fold in the soaked nuts. Form into 3/4″ balls and refrigerate overnight. Line a tray with waxed paper. Melt the chocolate and paraffin in the top of a double boiler over just-barely simmering water, stirring frequently and scraping down the sides with a rubber spatula to avoid scorching. Using a toothpick, poke each ball just enough to pick it up, then roll it in the melted chocolate to coat; arrange on the prepared tray. Remove & reuse the toothpick to dip the next ball. If desired, use a spoon dab some of the melted chocolate on top of the balls, to hide the toothpick hole and/or to stick a nut or other decoration on top. Store in refrigerator until serving. In case you’re willing to put up with a little risqué food photography, here’s a shot I took just before refrigerating the first batch. It makes my mouth water. What about yours?